I wasn't entirely sure what to call this post, because it's more of a timeline. I get so many people asking me, what are the next steps after tackling the top 10 swaps? Living a zero waste lifestyle, isn't like moving through a timeline. It's more of a choose your own adventure. Which is a pretty vague answer. I've come up with an outline of a step-by-step zero waste process, but it by no means has to go in this order. You can go in any direction you like, but for some that are struggling with next steps, I hope this helps! The first step is being aware of the problem. If you're on my blog, I'm assuming that you're aware of the problem. Long story short - we make too much trash. Check out this post about the recycling myth and this one about the problem with plastic. This is all about using what you already have. If you're anything like me, when I started going zero waste I had backups of lots of personal care items. I had a lot of paper towels, napkins, tissues, and other single-use disposable items. I had a pantry full of food, some of which was regularly passed over for more desirable items. I had a lot of things that weren't being used or serving a purpose in my life. I started to phase those items out. I started using what I had, instead of purchasing new. I intentionally planned meals to use up the odd items in the pantry with a vow to make better purchases in the future. For more information on what to do with your old plastic when you're going plastic free, check out this post. As you're phasing out old items, look to replace some of them with reusable items. The first place I tell everyone to start with is the big four. When looking to purchase reusable items, make sure to check the second hand market first! But, most importantly make sure that what you're buying is going to last you for a very long time. I'm always amazed that for every disposable item there is a reusable alternative. Make sure you're making a good purchase that you're 100% satisfied with. Don't buy something immediately. Take some time and think about it so you make the best purchase possible. When ever making a purchase, I always reference this flow chart to make sure I'm not adding unecessary clutter to my life. The hardest part about transitioning to a zero waste lifestyle was having patience! You're not going to go zero waste in a week! There can be this urge to throw everything out and start completely over, but that's contradictory to the lifestyle. The lifestyle says waste nothing! Use what you have to start. To be honest with you, almost three years later and I STILL have things from my pre-zero waste life. I plan on using those things until I can use them no longer. Zero wasters may look like they have it 100% picture perfect together, but we all started somewhere. In fact, take a look at me in this blog post. Once simple swaps have become routine, it's time to take things one step further. Take a look at what you're still throwing away and recycling. Start trying to find solutions for these items. This is where you get to have fun! It's time to think outside the box and try something new. You can always try something new. If you don't like it, you don't have to keep doing it. I have five rules I follow for personal sustainability. It's equally important to ecological sustainability. When I first started going zero waste, I made my own tortillas. If you've been following this blog for any period in time, you know how that went. Other than, "I HATE food waste," the most popular words you'll find on this blog is, "I HATE making tortillas." It was time for me to find a better solution. I hopped on down to a local Mexican restaurant and loaded up on tortillas in my own bag. Since then, I've found a tortilleria where I can get 20 freshly made tortillas in my own bag or $2. That's right. $2. Sometimes, it's just about finding a better solution. Going zero waste really is a journey. When, I started this lifestyle, I knew I wanted to avoid making trash and bringing plastic into my home. Over the years, I've learned so many new things. I've learned about the dangers of fast fashion. I learned more about the environmental impacts of a traditional American diet. I've learned about the devastating effects of palm oil and that we waste an INSANE amount of food. I'm constantly evolving, learning, and growing. Each day I learn something new, and I learn how to do better. No one is perfect, hence the motto of my blog, "It's not about perfection; it's about making better choices." But, every day we have the choice to leave a positive impact on the planet, and I'm just doing the best I can to make positive choices. Keep educating yourself. Constantly keep learning and ask yourself, "Is there something I can do better?" Maybe the answer is no, but maybe the answer is yes! Keep checking in with yourself. Always strive for better. You're definitely going to notice your consumer habits changing. The best piece of advice I can offer is to stop purchasing things for a while (not food obviously). You can take some time to examine what you need. I stopped buying things and focused on what I already had. I started finding contentment and it was really liberating. Stuff doesn't define us. Life isn't about acquiring more things. Living a zero waste lifestyle has taught me about what's really important: time and relationships. When I did really need something, I started looking at the second hand market first. Then I looked for an ethical place to make a purchase. All of the things I bring into my life are very carefully curated and bring a lot of value to my life. It's important to get involved in your supply chain. Know where your purchases are coming from and know what's going to happen to them when you're done with them. The concept of voting with your dollars is really popular in the zero waste movement. Every purchase you make is a vote for the kind of world you want to live in. Make sure your purchases are supporting your values and ideal world. It's difficult to become discouraged when you feel like you're the only one out there trying to make a difference. I promise, you're not alone in this fight! There are a ton of people working towards a common goal. Check out this blog post with five tips for finding a local zero waste community. I even have my own "top-secret" zero waste group. You can join us by signing up here! Once you feel like you've got the individual action step down, it's time to go one step further. 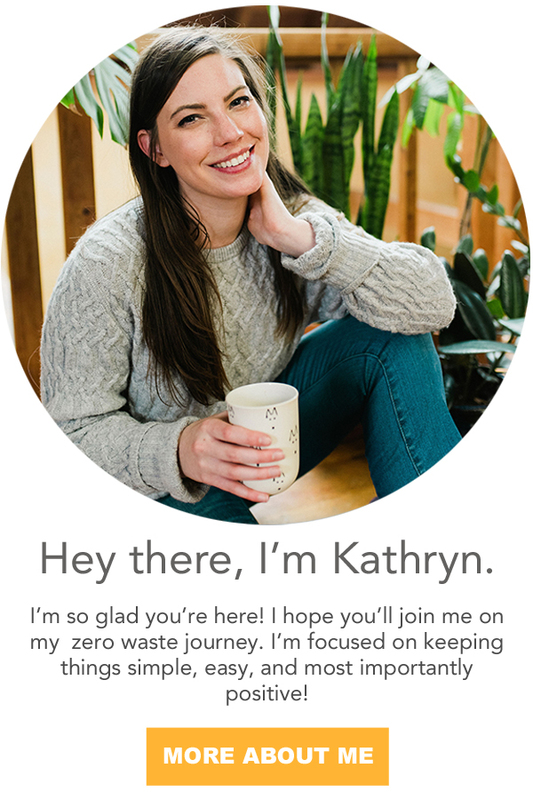 With your local zero waste community, it's time to pick out certain businesses you'd like to target. Maybe there's a restaurant you frequent and they put straws in your drink automatically. Write a letter with your group asking that the owner instate a new policy. Instead of automatically placing a straw in everyone's drink, make straws available by request only. Organize a documentary viewing for the local community. Host a talk at the library. Get a booth at the farmers market. Host an earth day event. Talk to teachers so they can start Zero Waste October. Encourage your workplace to go green with some initiatives. Start thinking about community action to help get others involved and grow the movement at the grassroots level. One of the best quotes I've heard, "Citizens and businesses must first act so policy can react." Policy reflects the will of the citizens and local businesses. By fostering a green community and gathering like-minded individuals, you'll have some serious power to negotiate with your local government. For more information on getting involved with your local government check out this post for my free policy workbook. My journey looks very similar to the one presented here. I hit step 10 earlier this year when chosen to serve my local government. I'm curious if your journey looked like this? Have you gone through all the steps? Were they in a similar order? What step are you on now?